With 2018 now under our belt we are looking forward to 2019 and hope you are too. 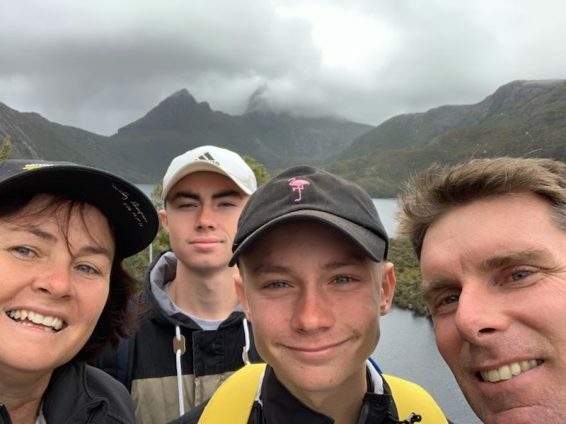 Craig, I and our kids were fortunate to be able to take a little time off to go to Tasmania in December. 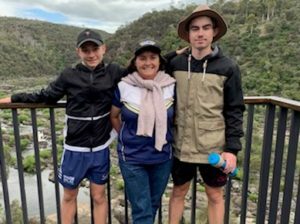 We did lots of their wonderful walks and although we didn’t get to go everywhere, Cradle Mountain and Freycinet National Park, along with the Tarkine area and Tasman Island Cruise were some of the many highlights. 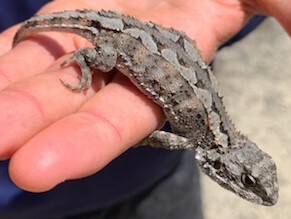 Of course with an ecology background we were on the lookout for as many of the endemic species as possible, as well as the more common ones. While not everyone’s cup of tea, we were lucky enough to see the three snakes found there (Tiger Snake, Lowland Copperhead and White-lipped Snake) along with the back end of a Devil as it took off into the native vegetation. We did see complete Devils at an animal sanctuary too – although it is not quite the same as in the wild. 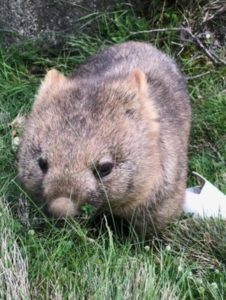 It was great seeing the wombats, Southern brown Bandicoot, Tasmania Pademelon and other mammals along with at least nine out of the twelve endemic birds found there (but who’s counting) including the Black Currawong, Dusky Robin, Scrubtit and the Yellow Wattlebird. It was also interesting to see the differences between the same species found there compared to here in Roma, Queensland. The Short-beaked echidnas we saw in Tasmania were all a bit lighter in colour and unsurprisingly the Red-necked Wallabies (known as the Bennetts Wallaby in Tasmania) had a much thicker coat and were a little stockier. 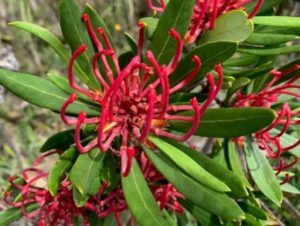 The wildflowers were in season at Cradle Mountain – absolutely beautiful and full of colour. The boys would take off to follow the tracks and go exploring before waiting patiently for me to catch up; while I took my time stopping to take numerous photos along the way – which by the way had nothing to do with my level of fitness compared to theirs (wink, wink – ha ha). As we travelled around we took note of how different people and the government ran their tourism businesses, noting down the things that seemed to work really well, to consider and possibly apply, if appropriate to our own BOOBOOK tourism business, located in Roma, Queensland. We were very lucky to score great weather (for Queenslanders); the Tasmanians were complaining about the heat. Many parts were in a drought; however we predominately saw only green grass, fat cattle and plenty of hay being made…Made us very envious as we travelled back to Roma and the reality of late 30’s and 40+ degree heat in the middle of our summer. And the dry weather is starting to take its toll. Moisture from the little bits of rainfall we had received in the months before and even while we were away has been sucked out, as the grass remains brown and crisp. Straight into some late weaning for us, which is where we take the calves off the cows to let them refresh and put on a bit of weight again before they have their next calf. Given the dryer season the cows were very happy to wave their older kids off. As a result of this their milk will dry up and they start putting more energy back into looking after themselves instead of their offspring. Not much difference to humans, when our late teenagers/early adults leave home and start fending for themselves, often saving a tremendous food bill! 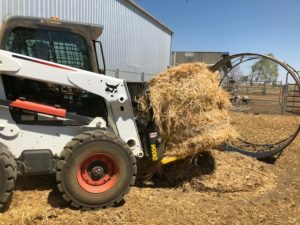 With the growing shortage of feed and lingering drought conditions around western Queensland hay prices are still relatively high, as others cash in on this heightened demand. We bit the bullet and bought a couple of semi loads of hay to use for weaning and to store away should conditions worsen. The calves are fed the hay in a yard or small paddock, while they get used to the idea of being away from their mums and become accustomed to handling (moved about) by humans. This makes it much easy later on, when we muster and get them in from a much larger paddock, and safer when we work them in the yards when they are bigger and faster. After a couple of weeks of weaning we take them back out to another paddock where they will continue to eat and grow. Farming is always a gamble due to unpredictable weather events and fluctuating markets. However we’re all a resilient bunch and try to make the best of every situation. Here’s hoping the next time I write, I can talk about some wonderful rain we’ve just received and great conditions we’re experiencing.